Week 41 – A letter I wish I could send to every ‘checked out’ healthcare provider. It’s the time of year when everyone gets excited about our annual Speak, Write & Promote: Become a Mover & Shaker workshop. This year it’s happening in Chicago on November 7th – 9thand it’s a chance to learn how to build a strong audience or customer base for your message and work. You can read all about this terrific program here. Over the last couple of months I’ve been lucky to be home to help a couple of family members deal with health issues. I’ve visited several doctors (and hospitals) and while some have been great (especially the nurses), some have been difficult and, at times, downright rude. This morning, while reflecting on my last unpleasant visit to a doctor, I wrote a letter in my journal as a way to work through my frustration. When I finished, I decided to share it here. I know there are many healthcare providers who read this blog, and chances are you’re not in need of these suggestions. Thank you for choosing to be a caregiver. I can only imagine how challenging it must be. I have such empathy for the fact that today’s medical system makes it nearly impossible to do the job you originally signed up for – help people heal. While I know you have limited time and resources, here are a few things that will actually make your job easier – and contribute to the healing of your patients so you don’t keep seeing the same faces with the same illnesses over and over again. First, if you’re running late, please have someone visit the room to let the patient know what’s going on. Waiting for a doctor is one of the most stressful parts of the experience. And an anxious patient makes for a bad start to an appointment. When you enter the room, please look him or her in the eye and smile. Your smile will go a long way in making the patient feel safe and comfortable. Before you say anything about their problem, please let the patient know you’re there to help. Ask him or her to tell you what’s happening. 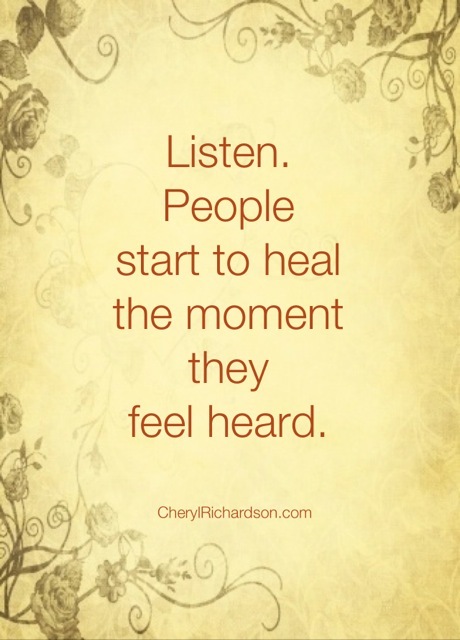 Then, listen for longer than you think you should and when the patient stops, ask: Is there more? Please be mindful of the fact that this person is feeling vulnerable and scared (regardless of their age or stature or what they say). As a matter of fact, you’re most likely dealing with a child in an adult’s body. When people are scared they often regress to five or ten years old, for instance. This means they’ll most likely have a hard time understanding big words and they’ll feel helpless to deal with threatening news. Please, please know that every word that comes out of your mouth will most likely be branded into the patient’s psyche for a long time. Every word. Followed by a horror story about a previous patient who ended up seriously ill (or dead). Every word you utter has the power to hurt or to heal. Contrary to what most people think, scaring someone in the hopes that they’ll change their behavior doesn’t work. Fear doesn’t inspire healthy action, compassion does. When patients leave your office feeling frightened, they often do the opposite of what you’d like them to do. They engage in behaviors that contributed to their health problems in the first place. These behaviors provide a false sense of comfort because they help patients calm their anxious feelings. Numbness is an attractive destination for a sick person who feels hopeless and helpless. What’s one thing you think you can do to improve your health? Who do you trust to support you with this action? While I know every health issue is different and often complex, you can begin the healing process, regardless of the issue, by empowering the patient to choose their next step. And, by enlisting the support of someone who will gently and lovingly hold them accountable, you have a better chance of the patient doing something that will get them moving in the right direction. I can’t imagine how busy you must be and I’m sure you’re as frustrated as we are by the system. And honestly, I imagine it’s annoying to deal with patients who don’t do what will help them heal. I’m sure you’d much rather be a healer than a machine. These simple actions might just help get the system moving in the right direction, too. P. S. – If you haven’t seen this video, please take four minutes out of your day to watch it now. It may just change everything.